Steven Williams (third from left) will lead the Student Alumni Association this year with the help of five vice presidents (from left): Lisa Harris, Anne Blaser, Melanie Anderson, Nicole Sofe, and Esther Ott. While Steven G. Williams (’11) was serving a mission in Sacramento, Calif., his brother Brian (BS ’09) was busy ensuring Steven would have things to do when he returned to BYU. As vice president of programs for the Student Alumni Association (SAA), Brian volunteered his younger brother to help with various programs—without Steven’s knowledge. 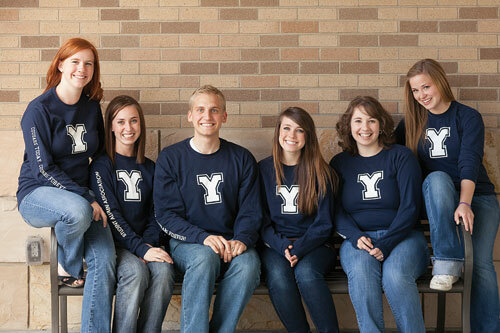 “I’m glad he did,” says Williams, of Centennial, Colo. “It’s my opportunity to give service to BYU while I’m still a student.” Now, nearly three years later, Williams is expanding his service to the school by filling the job of SAA president for the 2010–11 school year. During his tenure, he will supervise etiquette dinners, the annual BYU vs. Utah food drive, the hike to light the Y, semester survival kits, a networking dinner, the Traditions Ball, a Show Me the Money seminar, college lectures, and Parents Weekend activities. He will also be involved in New Student Orientation, and he is part of a team of students working on the Y Book, a book of traditions that will be distributed to all incoming freshmen and be available for purchase. Williams sees his role as creating a bridge between a student’s experience and the experience of being an alum. “We have started working closely with other organizations—college directors, specific colleges, and centers for learning and service—to get them to realize they can help further that vision with us,” he says. Assisting Williams will be five vice presidents: Anne E. Blaser (’11) of Citrus Heights, Calif.; Esther Ann Ott (’12) of Holladay, Utah; Melanie Anderson (’12) of Danville, Calif.; Lisa Harris (’12) of Twin Falls, Idaho; and Nicole Halversen Sofé (’11) of Kent, Wash.